God the Father, shown above Gabriel’s head, releases the Holy Spirit towards Mary in the form of a dove. According to the Christian tradition this resulted in Christ’s conception. 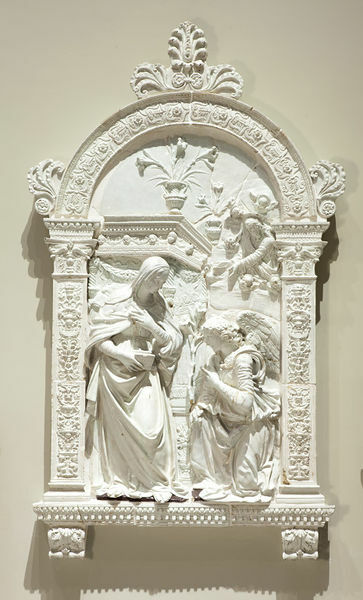 The theme of the Annunciation was especially popular in Tuscany as the feast of the Annunciation (March 25) marked the beginning of the New Year. The composition may have been based on a painting. Identical pillars were used on an altarpiece in San Lucchese at Poggibonsi (1517 or 1514) by Giovanni della Robbia, who was one of the three sons of Andrea della Robbia (1435-1525) to enter his father's workshop. The scene is set between pilasters decorated with grotesque patterns. The rounded top is crowned by a palmette, and the base is supported on two brackets. 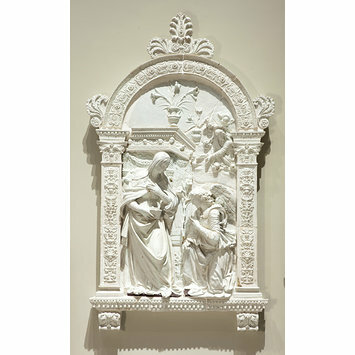 The Virgin stands to the left in front of a canopied bed, between whose posts hang garlands. On this cornice are two vases filled with lilies. She looks down at the angel who kneels before her with a lily. Between them is a vase containing an unidentified plant. Above right a small figure of God the Father surrounded by cherubim despatches the Holy Spirit as a dove. The foreground is coloured in porphyry glaze.